Well maintained and Low Km's! This sporty Camaro is one you can definitley boast about. Come take it for a test drive and be entered into this months test drive and WIN! ONLY at Laird Wheaton GM in Nanaimo.Ward's 10 Best Engines. Only 19,100 kms! This Chevrolet Camaro boasts a Gas V6 3.6L/ engine powering this Automatic transmission. SUNROOF, POWER, TRANSMISSON, 8-SPEED AUTOMATIC includes transmission oil cooler, RS APPEARANCE PACKAGE includes (RQ9) 20 5-split spoke premium Grey-painted, machined-face aluminum wheels, (T4F) high intensity discharge headlamps, LED taillamps, RS-specific grilles and (D80) decklid-mounted lip spoiler. *This Chevrolet Camaro Features the Following Options *JET BLACK, CLOTH SEAT TRIM, ENGINE, 3.6L V6, DI, VVT (335 hp [250 kW] @ 6800 rpm, 284 lb-ft of torque [383.4 N-m] @ 5300 rpm), ENGINE BLOCK HEATER, BLACK, 1LT PREFERRED EQUIPMENT GROUP Includes Standard Equipment, Wipers, front variable-speed, intermittent with washers, Windows, power with driver and passenger express-down/up, Wheels, 18 (45.7 cm) Silver-painted aluminum, Visors, driver and front passenger vanity mirrors, covered, non-illuminated, Trunk release, power. *This Chevrolet Camaro is a Superstar! *Ward's 10 Best Engines, KBB.com Best Resale Value Awards, KBB.com Best Buy Awards Finalist, KBB.com 5-Year Cost to Own Awards. 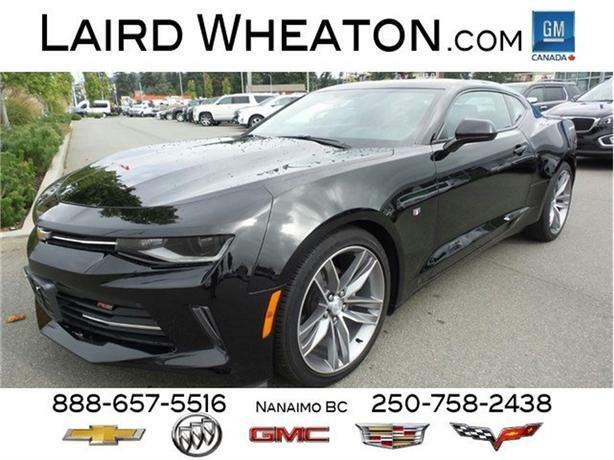 *Visit Us Today *Treat yourself- stop by Laird Wheaton located at 2590 Bowen Road, Nanaimo, BC V9T 3L3 to make this car yours today!